CH Technologies MAG 3000, manufactured by Palas GmbH, employs the operating principle utilized in the highly reliable Sinclair-LaMer generators. 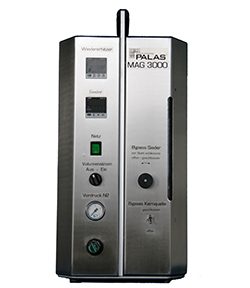 Palas has augmented the basic operating principle of the MAG 3000 with over 30 years of field experience. Palas developed a special core source to remove the otherwise necessary silica gel drying system. This generator is routinely used for calibration applications. It is especially useful for the calibration of particle monitors because it yields an accurately generated mono-disperse aerosol. With the MAG 3000, the size of an aerosol can be adjusted with the turn of a dial. It is best used with DEHS although other fluids are available on request.